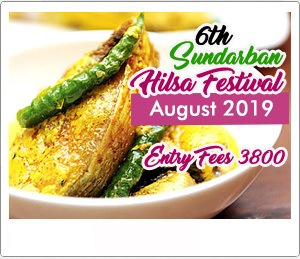 Tour Date :- 2nd, 9th, 16th, 23th, 30th August, 2019. Tour Cost : 3800/- (Night Stay at Launch), 4300/- (1 Night Stay at Hotel), 4800/- (Both Night Stay at Hotel). *** Special Discount for group booking. Day 1 : Gosaba Becon Bunglow | Hamilton Sahib & Rabindra Nath Tagore Bunglow | Birds Jungle. Day 2 : Pirkhali | Gajikhali | Deul Varani | Banbibi Varani | Do-Banki Tiger Reserve area Watch Tower & Cannopy Walk. Lunch :- Rice, Dal, Beguni, Hilsha Kachur Sak, Hilsa Paturi, Barishali Ilish, Chatni, Papad, Curd, Lemon. Dinner :- Khichuri (Hotchpotch), Hilsa Fry. Lunch :- Rice, Dal, Sabji, Hilsa Bhapa, Lau Pata Ilish, Chani, Papad. Dinner :- Mixed Fried Rice, Chili Chicken..
Breakfast :- Alu Parota (2 Pices), Vegetable, Boiled Egg, Tea/ Coffee. 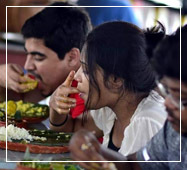 Lunch :- Rice, Dal, Fry, Vegetable, Hilsa Biriyani, Ilish Korma, Hilsa Tok, Chatni, Papad. Village Walk & meet Loacal people. Bird watching Session at "Pakhir Jungle". Baul Gaan (Traditional Folk Dance). 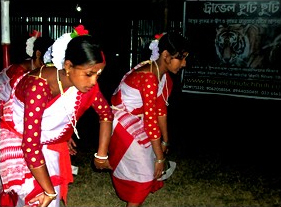 Jhumur Dance (Traditional Folk Dance by Local Village Girl). 3800/- (Night Stay at Launch). 4300/- (1 Night Hotel + 1 Night Launch). 4800/- (Night Stay at Hotel). Rs. 4300/- (Night Stay at Launch). Rs. 4800/- (1 Night Hotel + 1 Night Launch). Rs. 5300/- (Night Stay at Hotel). Becon Bunglow, Hamilton & Rabindranath Tagore Bunglow, Birds Jungle. Early Morning at 7.42 am we will start our tour by canning local from Sealdah Railway Station. After 1hr 10mnt we will reach Canning, and then Canning to Sonakhali by Auto. At 10.30 am we start our journey for Sundarban by Our Launch/Boat. Tiffin will be server on the way. Our First Destination is Hamilton Bunglow & Beckon Bunglow. At 3pm we will reach Sundarban Tiger Reserve Area. First day we will go ot the Birds Jungle locally name "Pakhir Jungle". After this session we will go to hotel. Enjoy the enchanting evening with local Folk Caltural program followed by snaks and tea. Dinner will be served at Hotel. Sajnekhali Tiger reserve & Mangrove interpretaion Centre, Pirkhali, Gazikhali, Duel Varani, Bonbibi Varani, Netidhopani & Dobanki Tiger Reserve & Watch Tower. Early morning at 7.30am we will start our Sunderban tour. First we visit at Sajnekhali Tiger reserve Area, Watch Tower, Mangrove Interpretaion Centre & Crocodile Pond and Cruise through Rivers and Narrow Creeks of like Pirkhali, Chora Gajikahli, Deol Varani & Bonbibi Varani. Our Last & next destination is Do Banki. After visit this tiger reserve area & watch tower we end our sundarban trip journey at Hotel. In the evening we will enjoy with Bonbibi pala & Local Baul Song which is include in sundarban package tour. Dinner will be served in launch/ Hotel. Sudhanyakhali Tiger Reserve & Watch Tower, Sarakkhali, Island Tour. 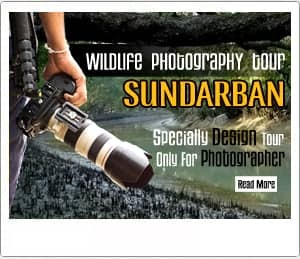 Early morning at 7.30am we will start our sundarban national park tour. Breakfast will be served at Launch. In this session we will Explore sundarban's differnt creeks like Sarakkahli 1, Sarakkahli 2 & also visit many different tiger reserve island. Our last destination of our sundarban tour journey is Sudhanykhali Tiger Reseve & Watch Tower. We will Return Back Sonakhali launch Gaht at Evening & head back to Kolkata with sweet meories.